At this Tsavo safari camp you can watch game around the waterhole and savour superb morning and evening game drives. Birdlife is plentiful with around 300 bird species identified in the area. With the experienced and knowledgeable local guides at Satao Camp, who know everything there is to know about Tsavo East, you can go in search of Big Five game in the lesser known areas of the park adjacent to the camp. 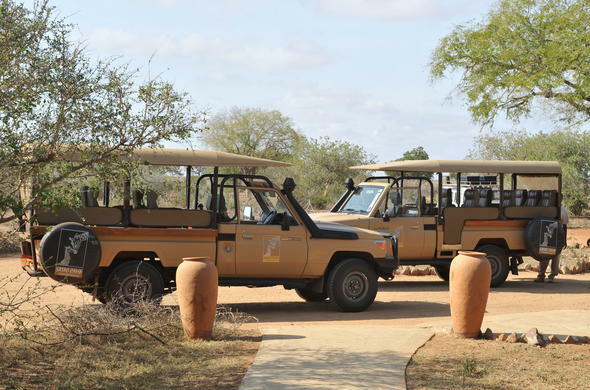 All Satao safari vehicles have been adapted to accommodate wheelchair users. You can also follow more general routes through the park around Voi River and the Aruba Dam. Tsavo East is a wonderful park for photography. The light is spectacular and there are amazing views especially of the Yatta Plateau, Lugard Waterfall and Mudanda Rock. At Satao Camp you can keep a look out for a great variety of birds such as Pearl Spotted Owls, Guinea Fowl, Starlings, Barbits and Hornbills. In the late afternoon you can once again head off into the bush and enjoy sundowners at a secret spot around a crackling fire, while the sun melts into the Sagala Hills.